BodyKey by Nutrilite, a weight management program from Amway, now offers Amway Business Owners (ABO) a chance to win big prizes, just by losing unwanted pounds and keeping them off on a sustained basis! 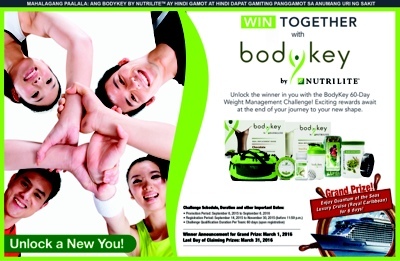 Unlike other weight loss programs, BodyKey by Nutrilite is personalized. It comes with scientifically formulated meal replacement shakes in chocolate or vanilla flavors, Nutrilite All Plant Protein Powder, Nutrilite Nutri Fiber Blend Chewable Tablets and Nutrilite Double X (31-Day Supply), meal plans based on nutrition guidelines endorsed by the Nutrilite Health Institute, and exercise strategies, that makes up a complete personalized program toward achieving your weight goals for life. Here is the video that will help and inspire you towards your goal of living the healthy life and shedding off those unwanted pounds. With the BodyKey 60-day weight management challenge, you and three of your friends will have a chance to win an all-expenses paid, six-day luxury cruise to three of Asia’s most beautifuland vibrant cities— China, Japan and Korea. The contest is simple: Take the challenge, and share your story! The team that shows the most dramatic results wins. Other prizes include iPad minis for the 1st runners up, and iPod touches for the second runners up. Nutrilite gift packs will be given to top performers bi-weekly and monthly.